Mannequin Pis in Olney (a Belgian-style bistro in a very ordinary strip mall). 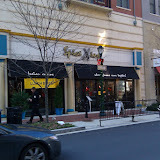 Great Places to Take a Date in Rockville? Go rock climbing on the indoor wall at the Civic Center Park. Any other suggestions to help out the romance-impaired?